The first episode of Season 9 of Kaun Banega Crorepati (KBC) was telecast on 28th September 2017. Kaun Banega Crorepati is a quiz show based on the British program Who Wants to Be a Millionaire? It originally aired on Star Plus for the first 3 seasons from 2000 to 2007 and was commissioned by the programming team of Sameer Nair. KBC Season 10 show started its registrations from 6 June 2018 and would start airing from mid-August 2018. 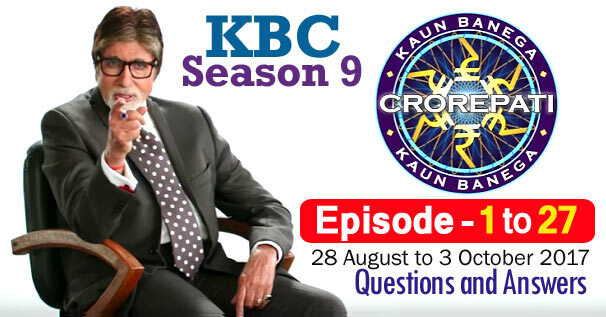 The KBC Questions related to General Knowledge, Sports, Science and Entertainment. These all general knowledge questions will be helpful to for you various Competitive Examinations and Interviews besides KBC. Remember, the answer to some question may be in accordance with that time, while the answer to those question may differ according to the present time.